Another colossal waste of taxpayer’s hard earned money. 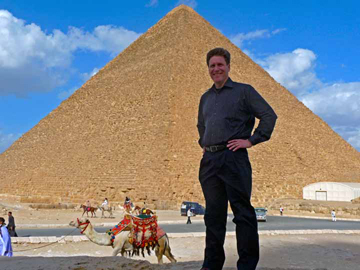 Boy, I wish my hard work consisted of visiting the Great Pyramids. It’s no wonder we are still stuck in LEO. It’s time to do away with a once great engineering and technical organization. Our earth is our home. We cannot live without nest.How cred we our problematic live? I’m reading reports in the popular literature that the ozone hole is repairing itself. Is that accurate? If it is accurate did the computer models predict a noticable recovery taking into account the actions taken under the Montreal Protocal? I’m trying to understand how the predictions, actions, and current observations correlate. You are correct about ozone recovering a bit. Take a look at these two recent stories. Though the stories don’t focus on the recovery (there is other science to report) the good news is embedded in there. i think this is very serious problem now.Ozone layer has a hole and we know that if it got bigger then one day all earth will get burn. i don&apos;t think we are taking any good step to stop the global warming. we are just pretending or making a noise nothing else. we have a to who can deal with that and gather ll world on a same place.